Brave Rotherham United rescued a point in time added on at The Valley against Charlton Athletic and could have taken all three. It was cruel luck on Rotherham United as Jordan Cousins put the home side ahead in the 83rd minute, taking advantage of indecision in the away penalty area to shoot home. But Steve Evans’ men fought back and a Rhoys Wiggins own goal, although the stadium announcer gave it to Danny Ward, brought them some deserved reward. Rotherham were the better side in the second half in the Championship clash and should have won. They had a big appeal for a penalty waved away and a Matt Derbyshire strike ruled out before the Addicks’ opener, and before their equaliser Paul Green and Adam Hammill both went agonisingly close. In a quiet first half, Conor Newton hit the post for the Millers and Johann Gudmundsson did the same for the home side. Charlton Athletic: Dmitrovic, Veljkovic (Lepoint 80), Bikey, Gudmundsson, Harriott (Gomez 89), Vetokele (Watt 63), Wiggins, Buyens, Solly, Cousins, Ben Haim. Subs not used: Etheridge, Wilson, Onyewu, Fox. Rotherham United: Collin, Richardson, Morgan, Arnason, Fryers, Newton (Hunt 60), Smallwood, Green, Pringle (Hammill 80), Derbyshire, Sammon (Ward 76). Subs not used: Thompson, Wood, Bowery, Barmby. A win for the Millers would see them go above their hosts in the table. Matt Derbyshire kept his place after scoring his first Championship goal for Rotherham on Tuesday night and he partnered fellow scorer Conor Sammon up front. The Addicks, without a win in 11 games, were playing their first home match under new manager Guy Luzon after last week’s goalless draw at Molineux. A quiet first half at The Valley finished goalless between visiting Rotherham United and Charlton Athletic. The Millers made the better start and almost took the lead in the seventh minute when Conor Newton’s stabbed half-volley from Ben Pringle’s searching cross came back off a post. After that, they rarely looked threatened at the back but didn’t create much in the way of chances. Johann Gudmundsson chipped on to a post for the home side in the 14th minute, while Craig Morgan produced two superb tackles to deny the speedy Igor Vetokele on the break. Charlton Athletic: Dmitrovic, Veljkovic, Bikey, Gudmundsson, Harriott, Vetokele, Wiggins, Buyens, Solly, Cousins, Ben Haim. Subs: Etheridge, Wilson, Gomez, Onyewu, Fox, Watt, Lepoint. 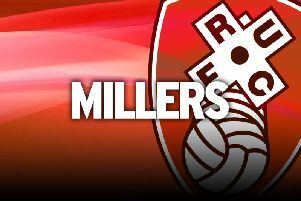 Rotherham United: Collin, Richardson, Morgan, Arnason, Fryers, Newton, Smallwood, Green, Pringle, Derbyshire, Sammon. Subs: Thompson, Wood, Bowery, Ward, Hammill, Barmby, Hunt.